If you own a truck, you have probably asked yourself “What’s the best truck bed tonneau cover for the money?” Well, that answer will vary based on the type of truck you have and the type of tonneau cover that you fits your truck best. Different pickup truck brands/models will not all work best with the same tonneau cover, so it is essential to know which options will work best for your vehicle. For new truck owners, you may find that your new truck does not come with a tonneau cover, but there are several reasons that you will want to find one that fits your truck. These covers can protect the bed of your truck, and they also allow you to transport items without worrying that they will get rained on during the trip. A tonneau cover for your new truck can be great for camping as well as simply transporting wood to use in your fireplace this winter. Regardless of whether you have a new truck or an older model, a tonneau cover can be quite beneficial. In this guide, we are going to take a look at several different pickup truck brands/models to help you find the best truck bed covers for you to consider. Before we dive into the tonneau cover reviews, let’s take a look at why a tonneau cover is a necessity for any truck owner and some of the different types of truck bed covers that are available to you. 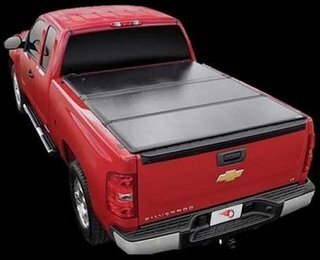 What are Truck Bed Covers Called? Why is it so Necessary to Have a Good Tonneau Cover? What Makes a Great Tonneau Cover? 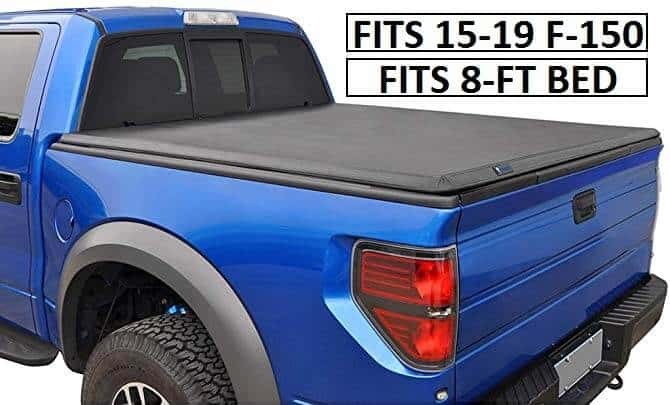 The best tonneau cover models for the Ford F-150 are going to vary due to the different bed sizes that are available for the vehicle. Also, if you consider that the model design changes over the years, you’ll realize that you won’t be able to simply buy a product without doing a bit of research and due diligence first. Fortunately, Tyger Auto has you covered with their T3 Tri-Fold series of tonneau covers for this vehicle. Not only can you find products that work for the 2009 series, which ended its run in 2014, but you’ll also be able to find tonneaus for more up-to-date variations. As a tri-fold model, you get a lot of versatility, and many owners love the fact that you can open up the tonneau in multiple ways. As a result, accessing the contents of your bed is very easy. As mentioned, truck beds vary from model to model, and Tyger Auto understands this. For this reason, for the 2009 series of F-150, the company offers both a 5.5-foot model as well as a model that’s designed for the larger eight-foot bed. For models that accommodate up to the current 2019 F-150, there are tonneaus that cover the 5.5-foot, the 6.5-foot, and the eight-foot models. So, why won’t the differing models of T3 work for all versions of the F-150? Well, between the 2014 and 2015 models of the truck, Ford changed the design of the tailgate. This means that: if you opt to use a tonneau from Tyger that had the fit of the 2009, it just will not fit neatly on the 2017 model. Additionally, if the cover doesn’t fit right, it can blow off or allow water into the bed when it’s raining or even decrease the airflow, which can cause you to use more gas during your travels. Since these models are sealed using foam weather strips, it’s crucial that you get the right product for your particular bed. Fortunately, Tyger provides you with enough variation that you should be able to get a good seal. The TruXedo line of products are known for their rugged construction, which makes them an excellent go-to tonneau brand. The TruXport, which is a roll-up style of tonneau, provides your bed with more than enough protection for most uses. Couple this with the fact that the TruXport is also very low-profile, and you’ll see that this is a fairly valuable product for your F-150 that can even help you save on gas mileage. In fact, according to the company, a tonneau like this one can save you up to 10 percent on your miles per gallon used. This is a top-mounted product, so it rests above the bed of your F-150 and has a very stylish looking design that blends well with the F-150 aesthetic. TruXedo used a leather grain fabric that’s very durable for the roll-up component of this tonneau cover, so this product is very protective of your bed’s components and cargo, even during inclement weather. The product mounts atop your existing bed using rails, and there is no drilling required due to the fact that the rails use a powerful clamp system to attach to your bed. While the material isn’t quite thick enough to prevent an unscrupulous person from cutting through the tonneau, it is weatherproof thanks to sealing and obscures the contents of your bed from sight. When attached and installed, it is impossible to unroll the tonneau without first unlatching the tailgate. Once the tailgate is down, you’ll have to disengage two locking latches on both sides of the tonneau. When it comes time to seal up the cover, the edges lock into place with a little force. The rolling cover seals over the rail system via industrial-strength Velcro, so it’s tough for moisture or rain to get into the interior. On the two corners of the tonneau, there is also a rubber seal to ensure that nothing makes its way into your bed. Throughout the roll-up cover, there are also steel bars so that the tonneau stays rigid. This product is one of the best tonneau covers for Ford F-150 models due to its ease of installation and security. Currently, there are six models of F-150 that can be accommodated by the TruXport. First, three models easily fit the 2009-2014 line. These three separate models are explicitly designed for the 5.5-, 6.6-, and eight-foot bed models of the F-150. For the 2015-2019 model years, there was a change in the tailgate design. For this reason, the TruXport tonneau that would fit on models from 2014 and earlier won’t fit. For this reason, the model numbers 298701, 298301, and 298701 were created. These models of TruXport have the same ability to work for the 5.5-, 6.6-, and eight-foot bed models and are designed to seal tight. Remember, if you’re looking for the best tonneau cover in the TruXport line for your vehicle, ensure that you purchase the right bed size for the right model. One of the chief weaknesses of this TruXedo product is the fact that you have to fasten the Velcro around the tonneau when you seal it. This can be a bit time consuming, but having the edges down improves the weatherproofing. Additionally, not attaching the seals also can cause issues in the rack system of the truck. The chief difference between the F-250, the F-350, and the F-450 Super Duty is the capability each has to deal with workloads, but each of these models is very versatile and offers a wealth of options when it comes to bed sizes. With each of these models being very rugged and capable, you may want a more solid tonneau cover to help manage the daily loads, and the T3 from Tyger Auto fits the bill. This is a tri-fold product that has a marine-grade vinyl cover with an aluminum frame, which is protected from even the most serious weather and moisture. As a tri-fold model, there’s also a lot of utility; you can simply lift up the portion that’s closest to the cab if you need material from that section, or you can opt to lift it up in the tailgate area. This is particularly useful compared to roll-up products because you won’t have to waste time rolling up the tonneau to reach items at the front of your bed. To install the T3 Tri-fold, you’ll first have to install clips into your existing bed’s rail system. This is a fairly easy process that ensures there will be a solid fit for the tonneau. From here, you can simply clip on the components of the tonneau using an Allen wrench, which ensures a tight fit. You’ll find that this provides for a very secure connection so that you won’t have to worry about heavy-duty cargo knocking the tonneau off the bed. With this product, you’ll never have to drill into the bed of your F-250, the F-350, or F-450 Super Duty. Since the product has an aluminum frame, many truck owners wonder, “Will it rattle while the vehicle is in motion?” Well, while a tonneau like this one might rattle a bit under very rough terrain, for the most part, the T3 is very quiet when driving. This is also a very svelte product; it doesn’t add a lot to the overall form factor of your truck, and the design makes the vehicle more aerodynamic. This additional airflow can improve your fuel efficiency, which is a reason many people purchase these covers for their trucks. This T3 tonneau cover is designed to fit the F-250, the F-350, and the F-450 Super Duty models from Ford. Additionally, there are two different models available that will fit two of the varying bed sizes that these trucks can have, which are eight- and 6.75-foot. One of the better features of this Tonno Pro cover is its construction; each of the tri-fold panels is reinforced with aluminum so that it’s very secure. Not only does this protect your bed’s contents from people that are up to no good, but it also provides protection from the weight of snow or debris. The aluminum material also doesn’t add a lot of weight to your truck because the material is lightweight, and the system uses the EZ-Clamp system to secure the tonneau snugly to your bed. Despite its toughness, aluminum can quickly fall prey to rust and corrosion, which is why Tonno used an epoxy coating to protect this material from moisture. In fact, this hard tonneau cover is capable of withstanding up to 350 pounds of evenly-distributed weight. This is very impressive, and since the F-250 through F-450 series of trucks are designed for heavy workloads, this capability can help reinforce your confidence. In theory and under uncommon circumstances, this also means that with cargo straps, you can utilize this flat surface to haul a few more items. Despite the fact that this is considered a hard cover, the top of the product is coated in a leather-like soft vinyl material. This material is also marine-grade, so tearing isn’t very likely over the lifetime of the tonneau. This vinyl is also secured via marine-grade terelyne stitching, which won’t fray and won’t be damaged by water or moisture. Not only does this vinyl coating look more attractive, but the edges of the vinyl attach to the sides of the rail using a front flap and Q-gasket system, which will ensure that moisture and excess water won’t make their way into the interior of the bed. The installation of this very secure and durable tonneau cover should take you less than 10 minutes thanks to the quick clamp system. There’s also no need to drill or assemble any of the tonneau’s components. Like other tonneau covers, this product makes the vehicle more aerodynamic, which can lead to a savings of anywhere between 10 and 13 percent in gas. When it comes to the truck models that this product can accommodate, the F-250, the F-350, and the F-450 Super Duty can all use this Tonno Pro tonneau cover. There are two specific models that may work for your truck that work with both the 6.8-foot and eight-foot beds. Both of these tonneaus easily detach when you have oversized cargo – you simply fold it up and store it in the bed. If you have a modern Chevy Silverado or GMC Sierra, you may be wondering which are the best truck bed covers for this particularly hardy style of truck. Fortunately, there are options on the market that can serve as some of the best low profile tonneau cover models that can be rolled. The Genesis Elite is a product by Lund that uses a durable twill fabric that is resistant to tears and even some cuts. This material also is mold-, mildew-, and UV-resistant, which definitely makes it a very durable and reliable option for those that just want to protect the contents of their truck beds. Are Tonneau covers easy to clean? It’s straightforward to simply wash this particular tonneau with a bit of soap and water. While it won’t necessarily protect your contents from someone that wants to cut into your bed, it definitely does a great job of obscuring your truck’s contents. Underneath the twill cover, the frame of the tonneau is made of strong-yet-light aluminum. This provides a sturdy structure for the tonneau, and since Lund has protected this material from moisture, rust and corrosion shouldn’t ever prove to be a problem, even after years of bad weather. Additionally, during tonneau cover MPG test results, products like this one reduce the drag coefficient enough to save you up to 13 percent on gas. The installation of the Genesis Elite is also very convenient; you won’t have to drill into your truck bed, and all you will really need for tools is a tightening socket wrench. 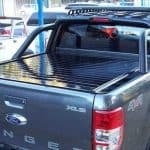 The tonneau clamps sturdily to the bed of the truck using rails, so it should provide a high level of security for all but the most determined of vandals. Also, the tonneau uses hook and loop fasteners to keep the product in place, which not only protects the tonneau from being blown away but will help keep your bed dry. As you may know, the Silverado and Sierra both have different bed designs, but using the clamps and the crossbar system will ensure a tight fit on both models. While each of these models will have different-sized beds based on the bed package you purchased, Lund ensures a good fit by providing three sizing options that include models for 5.5-, 6.5-, and eight-foot bed variants of the Silverado and Sierra. Each of these is designed to accommodate all models from 2007 to 2018, and if your vehicle has a back rack, there are back rack tonneau cover adapters to help you get a good fit. These can be found under part number 92519. Roll-up covers are an excellent option for the Silverado or Sierra due to the fact that they are easy enough to install but also provide a good level of protection for your cargo. This product features a tough leather grain fabric that is both weather resistant and attractive. This material is actually a marine-grade vinyl that is UV-resistant and won’t attract mold and mildew when it gets wet from time to time. You might recognize the TruXport from our review for the version designed for the F-150, and for the most part, this variation has all of the key features of that model. This includes a fitment that rests about 15 inches above the base of the truck bed, a very aerodynamic styling that increases gas mileage, and a no-drill installation that is very convenient and should only take about 20 minutes (or less). The dual-latching system is also very convenient and allows you to ensure that the tonneau is securely attached to the bed of the truck. When it’s time to attach the tonneau, you can even adjust the tension for a firmer or looser lock. The rails attach to the bed of your truck via clamps that can be tightened with a socket wrench, and since this is a roll-up product, you can quickly roll up the tonneau when you have larger cargo that doesn’t fit underneath. As a result, this is a very versatile product that provides a lot of value during everyday use, and while it may not protect from everything, it definitely comes in at a reasonable price point considering the premium features. This particular line of TruXedo is designed to fit trucks with beds that range from 5.6, 6.5, and eight feet in size. Each of these variants is virtually the same and use the same convenient, drill-free attachment system to ensure easy installation. Thanks to the universal design, the 6.5 and eight-foot models will fit the beds of both Silverado and Sierra truck models from 2015 to 2019. For the 5.6-foot variant, the 2014 Sierra and Silverado models are covered. As another product that can accommodate both the Sierra and Silverado lines of truck beds, the American Tonneau Company (ATC) soft tri-fold cover is both durable and versatile enough to handle any cargo load. As a soft tri-fold, the outer texture of the tonneau has a soft leather-like texture, but the frame is supported by aluminum bars. As a result, you end up with a tonneau that’s semi-soft like a roll-up, but is strong and is supported by hinges. The material used in the outer layers of the tonneau is textured vinyl, which makes it a very tough material that will protect your cargo. This material is weatherproof, windproof, and has a weather seal that will keep the contents of your bed nice and dry. As mentioned, the metal bars keep the tri-fold stable and easy-to-open, and ATC also designed these bars to bow outward so that water and snow will run off. Versatility is important when you’re selecting a good tonneau for your Sierra or Silverado, which is why a tri-fold can be a very popular choice. With a tri-fold tonneau like this one, you can open up a single segment to gain access to your tonneau, or you can carry large items like refrigerators safely while just folding up a couple of segments at a time. The hinged folds can be locked into place via a strap so that you can keep your tonneau open to the desired ties. In fact, you can remove the entire tonneau cover if you’d like. This is perfect for carrying larger items, and since the tonneau is lightweight, it can simply be folded up and stored among the cargo. When it comes time to seal up the tonneau, this ATC model has fiberglass-reinforced clamps that will ensure that it won’t come loose. As with many of the products in this guide, this model only requires that you clamp it to the body of your bed – there’s no need for any drilling. It’s also advantageous that ATC provides four free gifts that are designed to enhance the experience of owning their soft tri-fold cover. This product is designed with a couple of models of trucks in mind, so if you have a Sierra or Silverado, all you’ll have to consider is the bed size. For this reason, ATC produces three variants: one designed for 5.75-foot beds, one for 6.5-foot beds, and another for Sierra or Silverado models with eight-foot beds. The only limitation is that ATC hasn’t designed these to fit the 2019 models of the Silverado HD. Unlike the T3 series from Tyger Auto, which are tri-fold covers, the T1 series from this manufacturer is primarily made up of roll-up tonneaus. 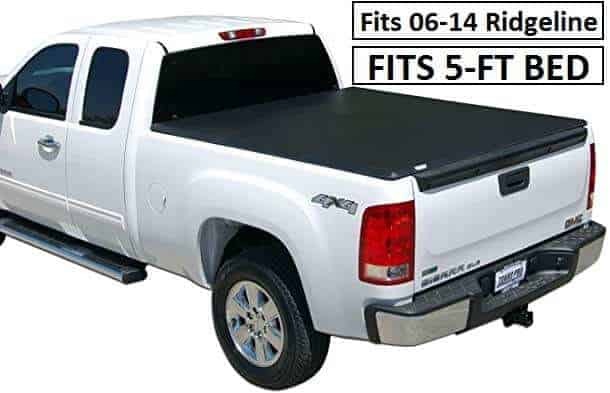 This particular T1 is designed specifically to accommodate the Chevy Colorado and the GMC Canyon models of vehicle, and this unit may well be one of the best inexpensive tonneau cover products for daily convenience. This is due to the fact that the tonneau is very easy to roll up, which means that you’ll have easy access to your bed’s content when you need it. There’s a misconception that soft covers are unsecure, but products like this are designed to keep your cargo safe. Not only is the roll-up material marine grade vinyl, which is hard to cut, but the sides are sealable using industrial-strength Velcro, which also keeps moisture and water from the interior of the bed. While you won’t have a to drill into the bed, the T1 uses a series of heavy-duty clamps to secure the product to your vehicle’s rails, which can grant you a sense of security. When you’re ready to close your tailgate, you can engage the tensioner so that the roll stays nice and tight and you can then close the fastening latches for true security. This is also a product that can work over the bedrail liner or under the bedrail liner, but if you are going to be installing it over, then small holes may need to be cut into the bedrail liner before installation. On top of all of this, if damage occurs, Tyger Auto has a fairly comprehensive lifetime warranty. Currently, there are two variations of this product: one that fits Colorados and Canyon models with five-foot beds and another model that fits six-foot bed models. Both are limited to the 2015-2019 run of these vehicles, but you can rest assured that each is designed specifically with a tight fit and a high level of reliability in mind. The Gator Pro tri-fold is only considered “soft” because of the fact that it uses natural grain matte vinyl in its outer construction, but when it comes to durability, this product is very reliable. Not only is the vinyl outer material made of tear- and puncture-resistant industrial-grade vinyl, but the outer shell is also supported by black powder-coated aluminum. With this protective layer, the metal superstructure won’t rust or corrode, and the company has designed this frame also to prevent snow or liquid pooling, which can lengthen the lifespan of the tonneau. The vinyl material used for the tonneau also is very attractive and emulates the look of fine-grain leather, and since it rests so flatly atop the bed, it adds to the sleekness of your Colorado or GMC Canyon’s overall design. The aluminum frame uses stainless steel hinges to ensure that the tonneau is always easy to open up, and if you opt to run with the tonneau open when carrying oversized cargo, there is a strap system to ensure that it stays locked in place. At the four corners of the tonneau are EPMD seals, which use a rubber foot to ensure that water and moisture can’t work their way into the interior of the bed. This is very useful for anyone looking to keep sensitive materials from becoming water-damaged. The tonneau can be locked in place via internal clamps, and it cannot be opened unless the tailgate is opened. This is a tonneau that attaches securely without the need for additional add-on rails. If you need the entire bed of the truck, you can completely remove the tonneau cover by simply removing the rear clamps. This makes it very easy to manage and reinstalling the tri-fold tonneau will take less than five minutes. Gator Covers makes these for five- and six-foot beds, which provides you with a variation to cover your specific model of Colorado or Canyon. Both versions clamp on, so you won’t have to worry about attaching components to a rack system. These are limited to the 2015-2019 variations of both models, -but if you have a modern Chevy or GMC in those lines, this is a great tonneau for you. If you’re in need of a lot of security, the UnderCover Flex Hard tonneau cover is a great tri-fold product to consider. UnderCover crafted this product out of heavy-duty fiberglass that won’t chip or warm, even when exposed to extreme elements. The material is textured and is designed to look very aesthetically pleasing to the eye. With such a heavy-duty material used in its construction, you won’t have to worry about accumulated snow causing damage to the tonneau, and rain has a tendency to bead off of the top of the cover. When there is rain happening that isn’t just hitting the top of the tonneau, this product still will keep your bed’s contents dry. It accomplishes this by having a channel at the edges, which directs accumulated water into a tube, where it is then directed away from the vehicle. As a tri-fold, this product provides you with more than a few options for bed access. To start, you can’t open up the tonneau without first unlocking the tailgate, and when you do, either the left- or right-side latch can be used to open the tonneau. If you don’t need access to the front of the bed, you can even access most items by just disengaging the tailgate. If you need more access, you can open a single hinge, two hinges, or you can fold the entire tonneau up until its parallel to the cab. At this point, built-in straps can be used to lock the tonneau into this position. As with most quality tonneaus, you won’t have to drill to install this product, and it can be entirely removed or installed within 30 minutes. When securing it, the product latches to the body of your truck similarly to how a trunk in a standard car latches closed. The tonneau easily fits any Dodge Ram in the 1500 through 3500 series from model years 2002 to 2008. While one size won’t fit all, there are variations for both 5.8-foot and 6.5-foot bed models. The most recent version of the Dodge Ram has some nice design aesthetics, and if you want to carry cargo, a good tonneau can really provide utility while also keeping your truck looking attractive. The Gator ETX tonneau cover for the 2019 Dodge Ram is an excellent choice for anyone looking to keep their belongings protected. This is also a no-drill tonneau, and installation requires very few tools and will take less than 30 minutes to complete. In fact, if you’re looking for the best tonneau cover for the money, a good soft tri-fold can be a great investment. Not only do these have a soft design, but they have frames and hinged areas that add a level of security and reliability to the bed of your truck. These are also great for presenting you with a low profile addition; in fact, tri-folds are great for adding a little more fuel economy to your truck by increasing the aerodynamics. This product is constructed of tough, tear-resistant vinyl that presents a tight seal that keeps water from entering the bed of your Ram. The aluminum frame is crafted of cross-bows, which prevent water and snow from pooling atop the tonneau during storage. To install the tonneau, you simply have to clamp it onto the structure of the bed and tighten it for security. This is a tri-fold product that can be locked into position with relative ease – just fold it up to the desired sizing and use the attached straps to keep it in place. In fact, if you have oversized cargo, you can remove the entire tonneau in seconds by unlatching the clamps so that you have room to haul your cargo. Tonneaus are a great option to protect the bed of your truck, and this particular model can keep your 2019 Ram looking great for years. This ETX product comes in two varieties that will allow you to cover your five-foot, seven-inch or six foot, four-inch bed. Both of these cannot be used in vehicles with the Dodge’s RamBox, so if your vehicle has one of these cargo-management systems, this tonneau variation will not be compatible. In many pickup truck bed cover reviews, TruXedo is considered to be one of the most reliable tonneau cover brands. This is due to the fact that these tonneaus tend to have premium construction as well as dependable durability. This product, which has a soft, roll-up design also grants some great versatility since it’s always easy to access in most road conditions. It also has versatility when it comes to the fit; with the Lo Pro, you can cover Ram models from 2009 to 2018. Every tonneau should latch securely, and this particular roll up product has a great latching system that won’t allow the bed of your truck to be accessed without first unlocking the tailgate. Once unlocked, it has a dual-latch system that only requires one of the latches to be used to open both sides. This allows you to manage the unlocking with one hand, which is useful for such a large truck model. The tonneau has to be slammed shut for the latching process, but this doesn’t take a lot of force, and this closing process can be compared to closing a trunk or a hood. To ensure that your bed is protected from the elements, this product utilizes Velcro along the edges as well as rubberized sections at the end. As a result, even visiting a car wash will not allow moisture to work its way into the bed. One of the classic weaknesses of soft roll-up tonneaus is the tendency for the cover to lose tautness, but this product has a spring-tensioner system that automatically adjusts the tightness of the cover. When it’s time to manage a larger cargo load, simply roll up the product entirely and use the safety straps to keep it tied securely near the cab of your Ram. As mentioned, this is a product line that has been designed specifically for the Dodge Ram models that have been released between 2009 and 2018. There are two models available that work for both the five-foot, seven inch or six-foot, four-inch beds varieties of the Dodge Ram. This model is compatible with models that include the RamBox, which can be advantageous for those with extra cargo needs. When it comes to the best tonneau covers for the Toyota Tacoma, the Tyger Auto T3 is a great option. It is a tri-fold truck bed cover that looks sleek and fits well on any five- or six-foot fleetside bed. Since the Toyota Tacoma has different sized truck beds for different model years, there are two models that you can purchase; one is designed for model years 2005 through 2015, while the other variation is made for trucks with model years between 2016 through 2018. It has a sleek design that will help make the truck more aerodynamic, which will in effect save you gas. The material for the cover itself is a marine-grade vinyl material that is quite durable. It tear-resistant, so you will not need to worry about the wind and damage happening to the cover while you are driving. In addition, it is a weather-proof material that will provide protection from the rain and other inclement weather. The frame of this cover is crafted from heavy-duty aluminum that has been coated to help extend its life and keep it from rusting. The cover also comes with pre-assembled crossbars that can be used to support larger loads of cargo. This tri-fold cover is simple to install; it has a clamping system that will do a great job securing the cover, and this model works well with bed liners that are installed under the bedrail of the truck. Drilling is not required for the process, and it will only require 30 minutes of your time at the most. The instructions and all of the hardware that you will need for installation are included with the cover. The front clamps are designed to keep the cover secure at all times, while the back clamps allow you to have quick and easy access to the bed of the truck. You can also easily fold the cover up so that you have more space to haul large cargo, or if you prefer, remove it completely within a few minutes. The Tyger Auto T3 also comes with a limited lifetime warranty, so most issues that you encounter with it will most likely be covered. As previously stated, one of the reasons that many truck owners get a tonneau cover is for the style and the way that it looks on the bed of their truck. The BAKFlip MX4 is a hard, tri-fold tonneau cover that has a model that is designed to fit a Toyota Tacoma with a five- or six-foot bed that was manufactured between 2005 and 2015. It is also available in both sizes for newer truck models that were made between 2016 and 2019. Made with heavy-duty aluminum panels and hard plastic material with a matte finish that not only looks stylish, but it has an anti-scuff and tear surface that will not easily be damaged. It is also designed to be water-resistant so that your cargo stays dry and UV-resistant to keep the cover from fading in the sun. This is a very versatile cover that can be opened from any side of the truck, and it comes complete with a strong latching system that adds durability to your truck. Because of this system, installation of the tonneau cover will not require any drilling. In addition, the entire installation process should not take longer than 30 minutes of your time. This is a tonneau cover that can be opened the entire way, which means that you will have full access to the bed of the truck for larger cargo if you need it. In fact, there are even rods on the underside of the cover that will hold it in place, and it can easily be released and secured back on the truck without any tools. This is quite a robust tonneau cover that is capable of holding any cargo that is up to 400 pounds, and since it raises up in the front of the bed, this truck bed cover is compatible with any BAK storage box, which gives you more options for carrying and hauling tools. It also comes with a three-year warranty that you can use if anything happens to the cover unexpectedly. When it comes to the best tonneau cover for the Toyota Tundra, you may want to consider the Tyger Auto T1 roll-up truck bed cover because it has a sleek look that also offers excellent aerodynamics to your vehicle, which will help you have better gas mileage. This truck bed cover is available in three different sizes, so whether you have a 5.5-foot bed, a 6.5-foot bed, or an eight-foot bed, you will be able to select this cover as an option. Depending on the year that your truck was manufactured, you will need a different sized cover. One is designed for trucks that were manufactured between the years 2007 and 2013, while the other option is designed for trucks that were manufactured between 2014 and 2019. The cover is made out of durable, marine-grade vinyl that is designed to be tear-resistant. The rails are heavy duty aluminum that have been coated to help protect them from the rain so that they do not rust. It is also designed to rest on the top of the truck bed, which makes it watertight to protect all of your cargo without sacrificing how the cover makes your truck look. There are also horizontal bars that you can use to support larger items that may not fit in the bed of your truck. If you are hauling larger items in your bed, simply roll the cover back and secure it with the Velcro straps so that you can safely drive down the road. Installation of this cover is quite simple; in fact, since the process does not require drilling, it should only take about 15 minutes to complete. The cover has a latch lock system that makes it easy to secure your item, but you will also be able to adjust the tension of the cover easily with this system as well. One of the most important things to consider when you are purchasing a new tonneau cover is whether or not it comes with a warranty. Fortunately, this option comes with a limited lifetime warranty that will cover most issues that you may have with a tonneau cover. When it comes to the Toyota Tundra, this flex hard folding truck bed tonneau cover is a great option that will give you the sleek look of a hard cover with the convenience of a soft cover. It is designed for both a 5.5-foot and a 6.5-foot truck bed, and it is compatible with vehicles that have the cargo system as well as those without one as long as your truck was manufactured between the year 2007 and 2019. This cover is designed to last a while, so it was built with durable material that is water-resistant as well as wind-resistant. In addition, the fiberglass panels are reinforced to add strength to the cover. It has also been coated with a UV protective coating so that it does not fade in the sun. The cover is split into three different sections, all of which will give you easy access to the bed of your truck. The cover fits snuggly inside the bed rails on the truck, so it looks nice. Installation is a breeze, and since there are no special tools or drilling required, it should not take up too much of your time. If you need the cover removed, it will only take a few seconds. You can also secure portions of the cover so that you can drive with the cover open, which is very convenient for a large load. Since this truck bed cover is made out of fiberglass, it is straightforward to clean and maintain. Simply use soapy, warm water to hand wash the cover, or if you prefer, you can run it through the car wash on your vehicle. When you wash the cover, it is important to make sure that there is no soap residue remaining on the cover because it can cause it to be discolored. Citrus-based cleaners are also not recommended. If you are worried about having a good warranty on your new tonneau cover, this model comes with a three year manufactures warranty. One of the best tonneau covers for the Nissan Titan is a model that is manufactured by TruXedo TruXport. Designed truck models of the Nissan Titan that were manufactured between the years 2016 and 2019. There are four options that you can purchase, so if you have a 5.5-foot truck bed or a 6.5-foot truck bed, this option can work for you. In fact, it will be compatible with trucks that have a track system as well as those without one. The first thing that you will notice about this roll-up tonneau cover is the sleekness of the design and how beautiful it looks on your truck. The cover is designed to sit about an inch and a half above the bed of the truck, and the black coloration of the cover will look great with any truck. In addition, the cover is made from high-quality leather grain material, which not only looks great, it is a durable material that is ideal for protecting your truck bed and cargo from the elements. The tension of this cover is going to be set to fit your truck when it arrives, and there is a dual latching system on the cover that will make it easy to secure it to your truck. In addition, since this is a roll-up, it is easy to access any part of the truck bed whenever you need access. It can also be rolled up and secured when you need to haul large, unwieldy cargo that does not fit under the cover. Installation of this tonneau cover is simple. The process does not require any drilling or the use of special tools or equipment. The instructions for the installation of this cover are included, and it will only take about 30 minutes or so to complete. If you own a 2005 to a 2019 Nissan Frontier or a 2009 to a 2014 Suzuki Equator, then one of the best tonneau covers for the money that you will find is the MaxMate Tri-fold tonneau cover. If you have a fleetside bed, then there are covers available for both a five and a six-foot bed. It is also black, which means that it will look nice on any truck, no matter what color it is. This cover is designed with marine grade vinyl that is designed to be tear resistant, which means that your cargo will be safe from heavy winds. It is also a water-resistant material that has been coated to add additional protection to the bed of your truck. The frame of the cover is made from heavy-duty aluminum, and it has also been coated to ensure that it does not rust from the moisture and dew from being outside all of the time. This cover gives the truck an aerodynamic shape that makes it more fuel efficient, and you will also be able to drive the vehicle while the cover is open because it has heavy duty buckles to help keep it secure. This is extremely useful for when you need to haul large objects that may not fit under the cover, but you do not want to remove the cover for the journey. When it comes to the installation of the MaxMate Tri-fold, it is actually quite simple to complete. No drilling is going to be needed to secure the truck bed cover, and all of the parts that you need to install the cover are included. In order to secure the cover to the bed of the truck, there are two sets of stainless steel clamps. The front ones will secure the cover tightly, while the back ones are designed to give you quick access into the bed of the truck. The instructions that are included with the cover are relatively easy to follow, so the full installation process should only take about 20 to 30 minutes of your time. In addition, this is a truck bed cover that only weighs about 26 pounds, so it can most likely be lifted by a single person, but if that is too much for you make sure to have someone to help you before you begin installing the tonneau cover. Another one of the best tonneau covers for the Nissan Frontier is the Tyger Auto T3, which conveniently also fits quite well on the Suzuki Equator. Both of the available models are designed to fit onto any Nissan Frontier with a model year between 2005 and 2019 as well as any Suzuki Equator with the model year between 2009 and 2014. The main difference between the two models that we are reviewing here is the size of the bed. This tonneau cover is available for beds that are both five feet and six feet in length, so make sure to measure your truck bed before making a purchase. It also needs to be a fleetside model for the cover to fit properly. This truck bed cover is a tri-fold, which means that you will have access to any part of the truck bed by simply folding back one of the sections. Fortunately, this cover works with trucks that have a utility-track system as well as those without one. It is also a very lightweight cover that only weighs about 26 pounds, so you will easily be able to lift it by yourself so that you can install and secure it to your truck. This cover is secured using stainless steel clamps, which will secure the cover so that the wind does not pull it off of the truck as you are driving. Installation of this pickup truck bed cover is quite simple, especially since the crossbars are pre-assembled. No drilling is needed to complete the installation process, and all of the hardware and the instructions that you will need are included with the purchase of this tonneau cover. The installation instructions are not that great, but even so, the installation should take less than an hour to complete. In addition, this is a very durable model that is crafted from heavy-duty aluminum frames that have been powder coated to keep them from rusting. The fabric of the cover is marine grade vinyl that has also been coated to help them resist the elements. Since this is a truck bed cover that is designed to be secure, when the tailgate is up and all of the sections are in place, there is very little chance that the rain can get through the cracks and cause a leak. There is also a limited lifetime warranty that comes with this cover in case anything needs to be replaced. 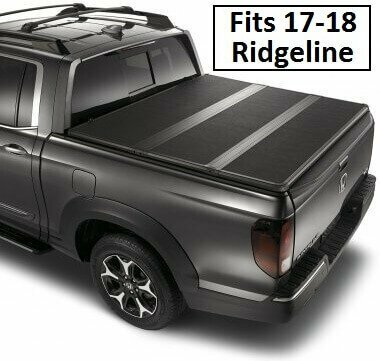 If you have a Honda Ridgeline model from the year 2017 or 2018, then this hard, tri-fold truck bed cover is going to be a great option for you to consider. It is crafted from a very durable, hard plastic vinyl material that is designed to withstand a lot of use and abuse. It fits nicely over the edge of your truck, and since all of the Honda Ridgelines that were built during these two years have a five-foot bed, you will never have to worry about purchasing the wrong size. The edge of the cover goes over the edge of the bed and locks into place when the tailgate is closed. This prevents the tonneau cover from being opened unless the tailgate is opened, which adds a bit of security to your vehicle. There is not an actual lock to secure the cover, but it is relatively secure, and it looks nice on the back of most trucks. When it comes to the installation of this cover, it does not take a lot of effort to install. No drilling is required for the installation, and it will only take about 15 to 20 minutes to complete. This truck bed cover is a bit on the heavy side, but you should be able to lift it to install it alone if you don’t have help. All of the parts that you will need to install this cover come in the packaging, but the instructions for the installation are only available online. This tonneau cover is designed to be water resistant, but during heavy rains, it can leak a bit around the edges, so you will need to make sure that any cargo that you have in the bed of the truck is safe from the rain. If you have a large load that you need to haul, the portion of the cover that is closest to the tailgate will fold up. In addition, the cover can be secured by a Velcro strap so that it does not blow off while you are driving. One of the best tonneau covers for the Honda Ridgeline is the Tonno Pro. This model is a tri-fold truck bed cover that is designed to fit a Honda Ridgeline that was released with a model year between 2006 and 2014. In addition, the truck must have a five-foot bed so that it fits the bed of your truck. This tonneau cover is made from marine grade vinyl that has a textured finish that is designed to keep the rain out. In fact, there is even a Q-seal that is located at the front of the cover that is designed to be weather tight so that none of your cargo will get damaged from the rain and the wind. Both sides of the cover are made from this durable, tear-resistant material, which will help the cover last for years. This is a tri-fold cover, which means that it is hinged together so that you will have access to each part of your truck bed whenever you need it. When you install this cover, you will find that it is actually quite an easy process. No drilling is required at all during the process; in fact, there is an E-Z clamping system that comes with this cover that is designed to secure the cover to your truck as you install it. This design is quite effective for keeping your cargo safe, and since it is already assembled when you purchase it, it will only take about 10 minutes or so to install it. In addition, if you need to transport cargo that does not fit under the truck bed cover, you can fold the cover and secure it in place with a snap so that you can keep it open while you are driving. In addition to the limited lifetime warranty that comes with this tonneau cover, it comes with four additional accessories that will be useful to have. It comes with a tailgate seal to make sure that your truck bed stays clean and an LED light that you can place anywhere in the bed of your truck so that you can easily see under the cover whenever you need. It also comes with a pair of gloves that will protect your hands when you are loading cargo into and out of the truck as well as a tonneau cover cleaner that will not only clean the cover, but it will also help protect it for the UV rays of the sun as well. In general, a truck bed cover is traditionally called a tonneau cover, but why are they called tonneau covers? Well, when vehicles were first invented, the seats were often open, but the back seat or the rear portion of the vehicle, called a tonneau, was covered. Many early tonneaus had a backdoor that allowed the driver to back up to the sidewalk so that the passengers did not need to step into the muddy streets. Since the back of a pickup truck is very similar to a tonneau, the cover that protects the bed of the truck took on the name tonneau cover. Folding Tonneau Covers – Folding tonneau covers, which included tri-fold covers, bi-fold covers, and more, are a great option to consider that is easy to install. The top is hard so that it can bear some weight, and you can easily access each part of the truck without removing the entire cover. Roll-Up Tonneau Covers – This is also a very durable tonneau cover that allows you to have convenient access to the bed of your truck. The main benefit is that you can open it as far as you need because there are no folds in the material that you need to follow. Retractable Tonneau Covers – This option is designed with the cover on a rail that goes into the head of the truck. This provides a versatile option that allows you to haul much larger items without removing the truck bed cover completely. Hinged Tonneau Covers – A hinged tonneau cover is going to look great with your truck because it can be designed to match your truck. They can be held open, but if you have oversized cargo, it may not fit as well with this type of cover. One of the questions that you may be asking yourself is “What is the main purpose of adding a tonneau cover, and why is it necessary to have one?” Well, there are quite a few benefits that you will have when you install a tonneau cover, but the main reason that many truck owners opt to purchase one is to protect the truck and any cargo that you may be hauling from the elements. The main reason that you choose to purchase a truck is that it gives you added cargo space, but when you do not have a cover, you will have to transport things in the cab of the truck to make sure that they stay dry. This will take up passenger space, and could even make it so that you need to take two trips in the rain to haul your passengers and your cargo. When you are purchasing a new tonneau cover for your truck, you will probably be asking yourself “What should I be looking for in a tonneau cover?” Well, a great tonneau cover is going to fit your truck perfectly, protect the bed of the truck and any cargo that you are carrying, and be made out of a durable material that will not tear easily during the first storm that you drive through. Before you purchase a tonneau cover for your truck, you will need to make sure that the one that you are considering is compatible with your truck. Not only will you need to consider the model of your truck and the size of the bed, but you will need to make sure that it works with the liner that you have in the truck bed as well as any utility racks or bed extenders that you are using. Before you decide which type of cover is best for your needs, you will want to consider what you will be using the cover for. Are you going to be hauling cargo in your truck? Will it be large cargo? Are you simply looking for a cover to help protect your truck from the elements and add style to your vehicle? Depending on how you responded to these questions, you may want to consider a specific type of tonneau cover over the rest. In addition, you will want to make sure that you get a tonneau cover that is easy to install. Most models will require less than 30 minutes of your time, but if the cover is heavy, you may have issues lifting it yourself, so make sure that you have help if you need it. Also, make sure that the cover that you get is easy to clean because some models will require special cleaning products to maintain the quality of the material. What other reasons should you opt for a good tonneau cover? Security – When you have a tonneau cover on your truck, you can easily use this secure space for storage. As long as your tailgate is locked, anything that you store under a tonneau cover is going to be secure. This means that when you go camping, you can easily have valuable items stored out of sight. Versatility – Different tonneau covers are designed to do different things. For example, some tonneau covers are designed with racks, which will make taking bikes or a boat to the lake easy. It could also be quite useful to someone who needs to haul ladders around on a daily basis as well. Design – Regardless of the type of tonneau cover that you want for your truck, it is important to note how stylish one of these truck bed covers can be. For some, style is more important than functionality, but with a good tonneau cover, you can easily have both. Fuel Efficiency – Since a tonneau cover will make your vehicle have a more aerodynamic design, it makes sense that keeping the air out of the bead of the truck would be a great way to help save fuel and make traveling more efficient. One of the most important things to consider when you are looking into getting a new tonneau cover for your truck is the size of your truck’s bed. Not all trucks have the same size bed, even if they fall into the same category. A short bed can be anywhere from five feet, five inches to five feet, eight inches. A standard truck bed can range from six feet, four inches to as long as six feet, seven inches, and a long bed will typically be around eight feet in length. With all of these different bed lengths, it is essential to know the length of the bed so that you can get a tonneau cover that fits snugly. Of course, there are going to be tonneau covers that are designed for your truck’s specific make and model, but what if you are looking for a more generic truck bed cover that can be used for several different trucks. Well, you will need to get out your tape measure so that you can make sure that you are getting the right cover. It is best to record the measurement in inches so that you are precise, and you will need to take the measurement from the bulkhead of the truck, which is the area on your vehicle where the bed and the cab connect, to the tailgate. Measure from inside the bed so that the cover will fit properly. Once you have the measurement to the inch, you can simply divide it by 12 to find out the length of the bed. It’s amazing how easy many tonneaus are to install; in fact, it’s not uncommon for there to be models that take less than a half hour to affix to your truck. While there are models that will attach to your bed’s track system, many tonneaus simply use clamps so that the tonneau is firmly affixed to the truck. For this reason, you’ll find many situations where you’ll just need simple tools like a socket or Allen wrench to secure and install your tonneau. In addition to this, you may also find models that have easy-to-install and remove twist clamps. These types of clamps can simply be twisted and folded for a strong seal that will resist many road conditions. With these models, you can usually remove the tonneau in less than five minutes. In some circumstances, you’ll have to clamp on a rail system atop your truck’s bed. Usually, this is similar to clamping on a tri-fold-style device, but in these circumstances, the majority of tonneau’s with attachable rails are roll-up style tonneaus. Once the rails are installed, it’s usually a simple procedure to attach the head unit and roll out the soft tonneau. Q-1: Can I use accessories like bike racks and crossbars with my cover? So, will your tonneau covers work with other truck bed accessories? This will depend on the bike rack or crossbar design. Currently, there are models of accessories on the market that are designed to fold down and fit under a tonneau, but some models simply won’t fit under the cover. With that said, when using accessories that use the utility-track system or crossbars, you can simply roll-up, fold, or remove your tonneau when these items are in use. Q-2: What do tension adjustments do? When you are using a roll-up tonneau cover, there is a tendency for the tonneau to sometimes become looser, which can be problematic when you’re trying to protect your cargo. Fortunately, some models have automatic tension adjusters that pull the tonneau tight over the bed of your truck, which will ensure a tight and fairly secure fitment. There are also manual tension adjusters that can do a similar job, and adjusting the tension from time to time can also protect your bed’s contents from moisture. Q-3: What if I need a replacement part? Amazingly, many tonneau manufacturers protect their products with lifetime or limited lifetime warranties that protect the tonneaus when damage occurs. In addition to this, you can contact the manufacturer to purchase things like replacement clamps or adhesive strips so that you can elicit repairs yourself. Q-4: What should I do if I have a warranty issue or missing/damaged part? If you run into issues with the warranty, it’s a good idea to contact the manufacturer. Usually, tonneau brands are willing to work with their customers. Q-5: What are some well-known tonneau cover brands? There are several key brands of tonneau manufacturers. These include TruXedo, Tonno Pro, The American Tonneau Company, Tyger Auto, BAK, UnderCover, Gator Pro, Lund, Roll-N-Lock, Pace Edwards, MaxMate, Trident, Amp Research, Decked, Access etc. As you can see, there are definitely options out on the market, and in addition to there, some car manufacturers even produce OEM models of tonneau that can be very competitive. As a general rule, most brands have a lot to offer, so if you’re unsure where to begin, take a look at truck bed cover reviews and compare features. Q-6: Does a tonneau cover lock? In almost every situation, you’ll want a tonneau cover that locks for both convenience and security. When you purchase a tri-fold model, it’s common for the individual segments to lock, which is why these products are considered to be very versatile. These types of tonneaus also have a tendency to slam lock when closed with the tailgate raised. For other types, most lock into place using latches or mechanisms on the tailgate itself. Is it a theft-deterrent? These locks not only protect your belongings from theft, but they also prevent the tonneau from blowing off while you drive. As a rule, never buy a tonneau that doesn’t lock securely to your truck’s bed. Q-7: Will my tailgate open with a cover? Tonneaus are designed specifically to allow you to open the tailgate, even when the tonneau is attached. This will allow you to simply reach into the bed and grab the items closest to the rear of the vehicle. This provides a good level of security because the tonneau will be locked with the tailgate and will require you to lower the tailgate if you want to roll or fold up the tonneau. Q-8: Will tonneau covers work with other truck bed accessories? When it comes to items like bed liners, you may have to cut small holes into the liner in order to install a tonneau. In other cases, you’ll need to trim the spray-on bed liner at the bulkhead side of the bed. Outside of these examples, it’s possible to find bedslide bed bins, truck stop cargo bars, and even bed storage pockets that work with modern tonneaus. It’s important to note that some tonneau products have extra features to become compatible with included truck accessories like RamBoxes. Q-9: Where does the water go after pooling on top? This vastly depends on the type of tonneau – water can cause damage to some types of tonneaus, so it’s important to make sure there are features that prevent this kind of damage if you live in a place with difficult weather. For example, a good tonneau should have either a channel to slough off water or a design that allows water to simply run off the surface. Frozen water or snow can cause damage to some types of materials, so having it resting on the surface can be problematic. On the other hand, many hard tonneau covers are designed to withstand water and snow, but it will always depend on the product. You might ask, are tonneau covers Waterproof, and Can they keep water out? Q-10: Is the cover stable for 50+mph winds? As with anything this will depend on the model and material of the tonneau. Most tonneaus are connected to your truck by a rail or clamp system, so it should be very hard to dislodge them. That being said, tough winds can definitely lift soft cover models if they aren’t latched on. To avoid potential issues, it’s a good idea to ensure that soft, roll-up covers are taut so that wind can’t get into the bed and potentially dislodge the cover. Q-11: How much weight can a cover hold when closed? This depends on the model – some tonneau covers don’t have much in the way of carrying capacity, but there are also hard models on the market that can withstand a weight of 350 pounds. Having a good weight management system can save your tonneau cover from damage during a snowstorm because snow can be very heavy when it accumulates. When purchasing a new tonneau, check into its weight capacity so that you can know how well it will withstand additional weight on its topmost surface. Q-12: What should I avoid when shopping for a tonneau cover? Always avoid blindly purchasing tonneau covers for your trucks – many tonneau covers are designed explicitly for select vehicle models. For example, while there may be models that will work for both Sierra and Silverado beds, you’ll still run into fitment issues if you try to use the same tonneau for a Dodge Ram. Fortunately, most manufacturers provide the data so that you’ll know which tonneaus fit which vehicles. Additionally, always try to purchase tonneaus that latch securely; snap-on products almost always prove to be inadequate when keeping your cargo protected. Also, when it comes to soft tonneaus, never purchase tonneaus with fabric materials – these aren’t waterproof in most cases. If you own a truck, there are quite a bit of options that you can consider to help protect your truck bed. Depending on the make and the model of your vehicle, you may find that the best option for your needs is a roll-up cover or maybe it is a tri-fold. So, What Should I Look For in a Tonneau Cover? For many of the trucks on the market, there are several different options that could fit your truck, but before you choose one, make sure that the cover that you are considering is compatible with the size of the bed as well as the year that the truck was released. Bed sizes may only vary slightly, but an improper fit could cause the tonneau cover to leak or even tear in inclement weather.